Quick & Easy Pickles. Really! They’re everywhere. We see plenty of them at the table around the holidays. You will see them this weekend for Thanksgiving. No, I’m not talking about turkeys and potatoes. I’m talking about pickles of every kind. Everyone has their favourites. Mine are pickled beats, cauliflower and good old bread & butter pickles. Maiu loves a good dill pickle. Until recently, the only way we could get them on the table would be to buy them at the grocery store. Well my friends, let me introduce you to a really simple way to make them at home, without having to make a massive batch, without having to learn the art of canning, without having to boil/sterilize tons of jars and lids of Bernardin (a.k.a. Mason) jars. 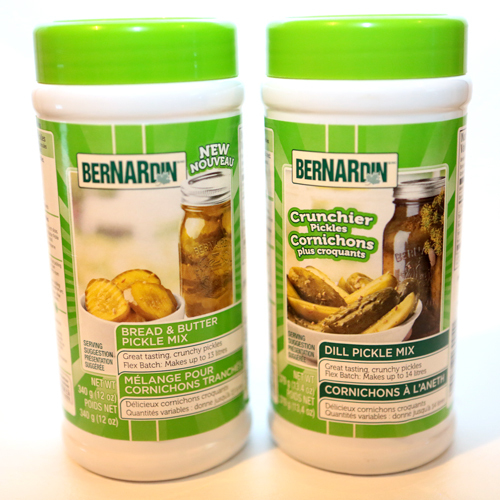 This is the first in our series of product reviews, and we’re starting with Bernardin Pickle Mix. They are so easy to make, it’s scary. Essentially, cut up enough cucumber/cauliflower/beats to fill two one litre jars, then boil vinegar and powdered mix (and sugar if you’re doing Bread & Butter). Once you’ve brought this to a boil, put it into a big bowl with your veggies and let it get to room temperature, then throw it into the jars. Too easy you say? Yeah, I’ve said it too. I’ve made your classic bread & butter with this, but I’ve also pickled beets, cauliflower and pearl onions with this and honestly, they are so delicious. Maiu has used the dill mix a few times also, and we’ve yet to do the store bought stuff since we’ve tried this. You can’t take the Enjoy Now literally. I would give it a couple days before you crack the jar open for the first tasting, but the longer they sit in the jar, the stronger the taste gets. I really love them around the 2-3 week mark. We found this miracle mix at our local Walmart. I believe we paid about $4 or $5 each. Each recipe asks for 1/4 cup of mix. You can easily get 4 or 5 batches out of one container. I know it’s totally possible to go out and buy all of the spices needed to do this from scratch. We’ve had a tough time finding black currant leaves for Maiu’s dill pickles though, and I’m not up for running around town trying to get everything needed for this. Honestly, I’m COMPLETELY happy to continue with the Bernardin Pickle Mix. Thanks Bernardin. Have you tried this yourself? If so, with method did you try? What did you think? Let us know. We’d love to hear from you.